Recommender systems are not one-size-fits-all; different algorithms and data sources have different strengths, making them a better or worse fit for different users and use cases. 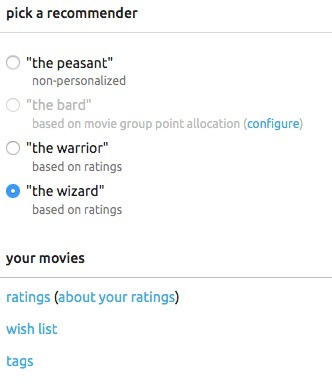 As one way of taking advantage of the relative merits of different algorithms, we gave users the ability to change the algorithm providing their movie recommendations and studied how they make use of this power. We conducted our study with the launch of a new version of the MovieLens movie recommender that supports multiple recommender algorithms and allows users to choose the algorithm they want to provide their recommendations. We examine log data from user interactions with this new feature to understand whether and how users switch among recommender algorithms, and select a final algorithm to use. We also look at the properties of the algorithms as they were experienced by users and examine their relationships to user behavior. We found that a substantial portion of our user base (25%) used the recommender-switching feature. The majority of users who used the control only switched algorithms a few times, trying a few out and settling down on an algorithm that they would leave alone. The largest number of users prefer a matrix factorization algorithm, followed closely by item-item collaborative filtering; users selected both of these algorithms much more often than they chose a non-personalized mean recommender. The algorithms did produce measurably different recommender lists for the users in the study, but these differences were not directly predictive of user choice.